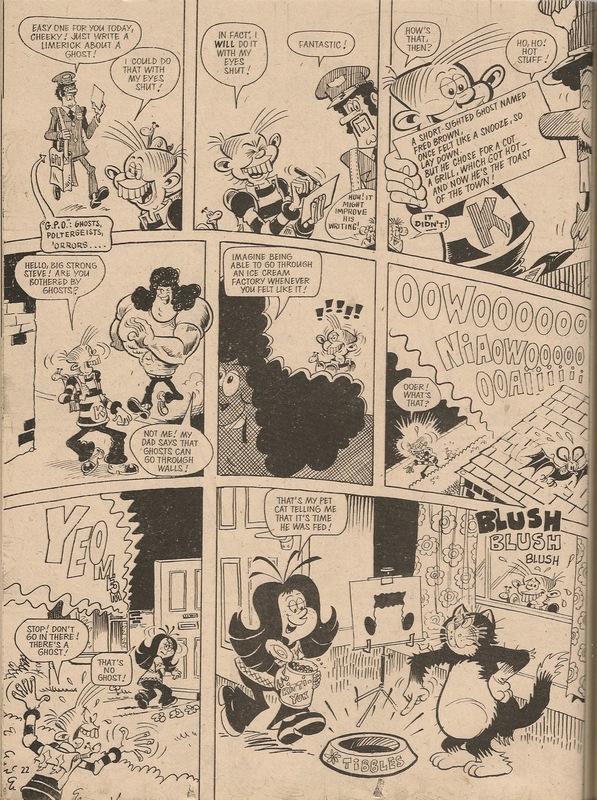 In previous instalments of this series of 'The Rejects' posts, I've examined supporting characters from the 'Ello, it's Cheeky\'Ello I'm Cheeky pages of Krazy who, despite being given a name, didn't accompany the toothy funster into the pages of his own comic. However, the character coming under the spotlight today failed to make the break into Cheeky Weekly even though he was given two names. 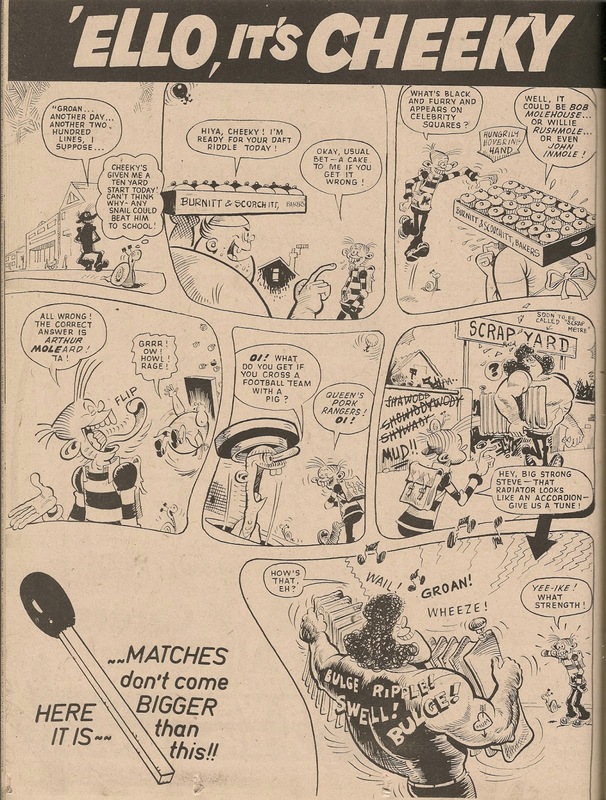 Scrap yard worker Big Strong Sam made his debut in Krazy issue 2, dated 23 October 1976. All the artwork below is by Frank McDiarmid. 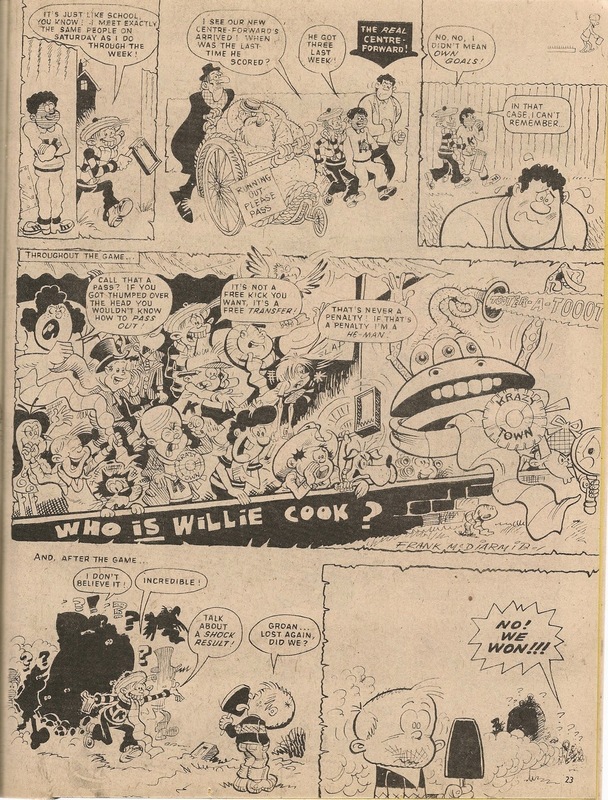 A week later the Big Strong one returned, but now called Steve and seemingly the sibling of a Cheeky Weekly stalwart who made his debut on this page. 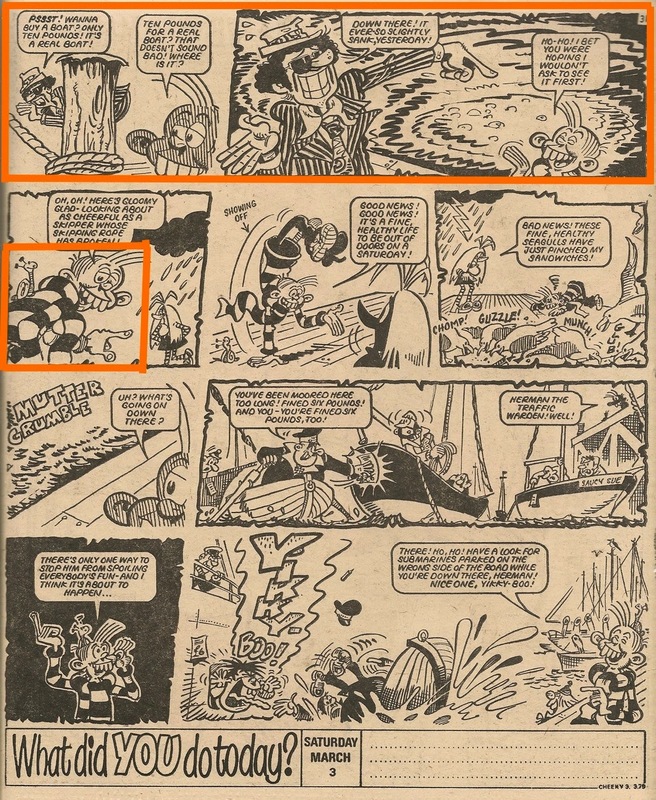 This time Cheeky's muscular mate featured across a whole page, so at this point it looked as though he may become one of the regular cast of Cheeky's pals (if only the scriptwriter could sort his name out). 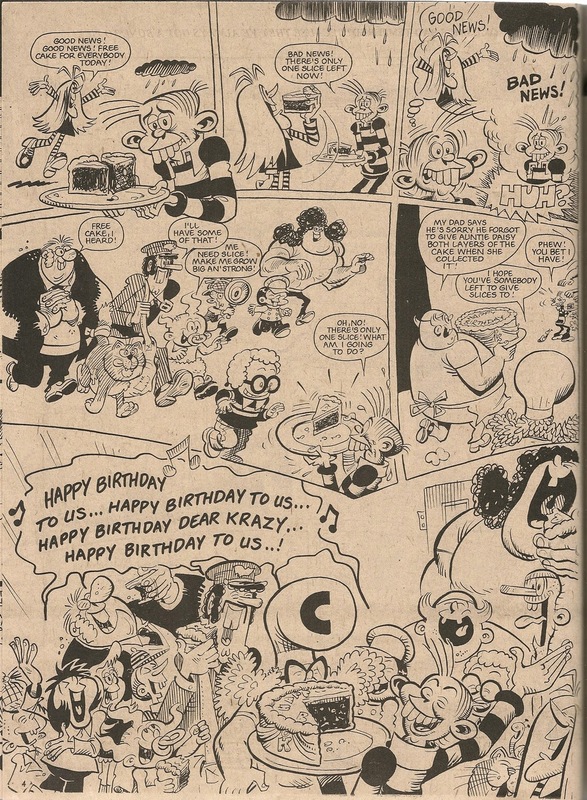 Sam\Steve was back in Krazy dated 27 November 1976 where he was unnamed among the Krazy Town FC 'supporters' at Saturday's match. So despite a promising start, Cheeky's scrapyard stooge eventually fell into obscurity. Maybe the scriptwriter couldn't think of many 'strong' jokes. If Sam\Steve had transferred into Cheeky Weekly there would have been the opportunity to develop him into Ursula's boyfriend. This is something that I should have posted a long time ago, but only started thinking about recently as I began looking at the latter few months of Cheeky Weekly in my series of issue summaries. 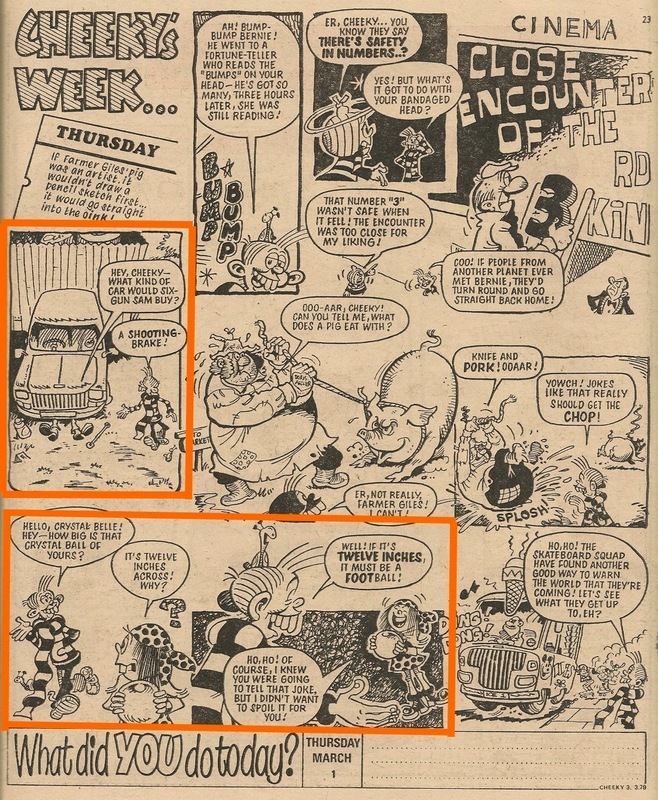 Here's a list of all the features to have appeared in Cheeky Weekly, ordered by the issue date in which they commenced (and in the case of multiple features commencing in the same issue, further sorted by the page number on which they made their debut within that edition). The feature's end date is also shown, as is its original source(s) in the case of reprints. The first column shows the feature's position in the sequence. A link to the the appropriate blog post (where available) is also provided. Most recent update - 13 October 2017: I had previously named the feature in the 21 April 1979 issue which gave assembly details for the Top Ten poster as 'Poster instructions', whereas all the other 3 appearances of the same feature I had named 'Top Ten poster instructions'. Changed the name of the 21 April 1979 instance to match the others. Update 29 September 2017: I had previously individually named each of the joke booklets which commenced in Cheeky Weekly dated 17 November 1979. For example 'Farmer Giles booklet', 'Knock-Knock booklet' etc. I have now given them all the name Cheeky's Cut-Out Comedy Catalogue, since that's the name under which they appeared. 65 Who's Afraid of the Big Bad Wolf 24-Jun-1978 30-Sep-1978 Cor!! 81 Hickory Dickory Doc 16-Sep-1978 16-Sep-1978 Cor!! 82 Sonny Storm 23-Sep-1978 23-Sep-1978 Cor!! 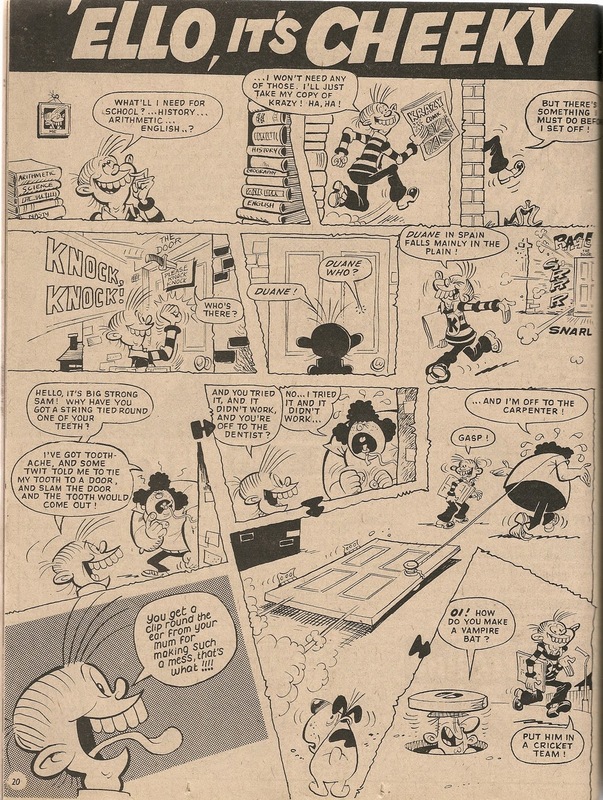 Bruce has posted a classic Elephant On The Run episode. 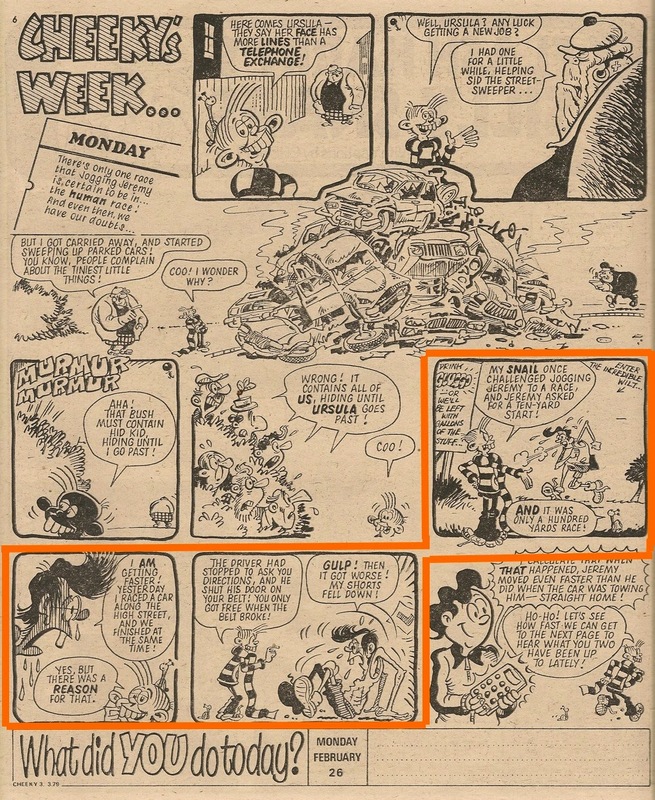 Even-numbered weeks of IPC's 1979 Star Guest promotion saw representatives of Cheeky Weekly visiting Whoopee! and as we've reached week 16 of the sales-boosting sallies into companion comics, the only question is who has been chosen from the ranks of CW superstars to promote their comic. Stepping forward to do his duty for the second consecutive week (the previous week in Whizzer and Chips) and his third time as a Whoopee! Star Guest is the toothy funster himself. Disco Kid's 'Leaf Carrot' joke mystifies me. Anyone? Update - Peter and Bruce have solved the riddle - see the comments below. 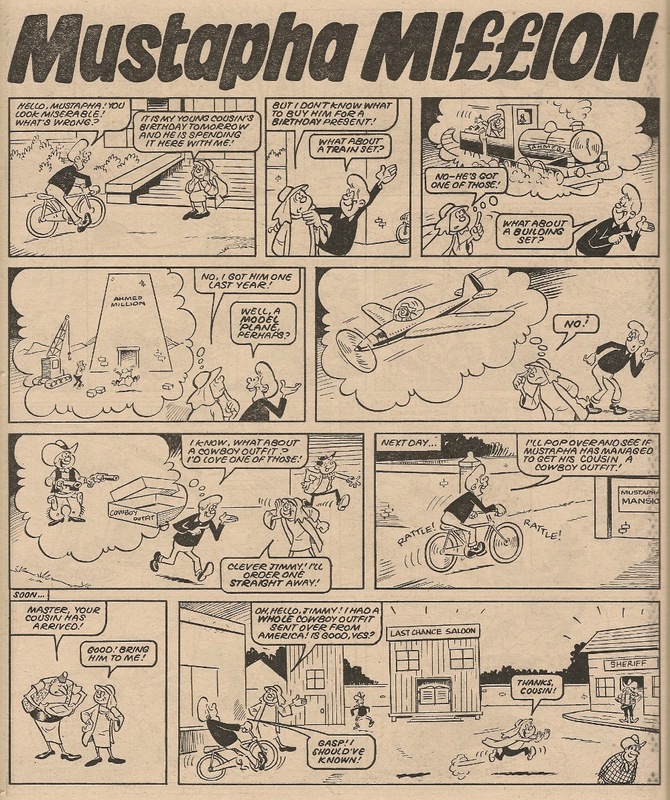 Like Cheeky's promotional outing in last week's Whizzer and Chips, this strip is actually a mash-up, re-using previously published Frank McDiarmid art to present some new gags. 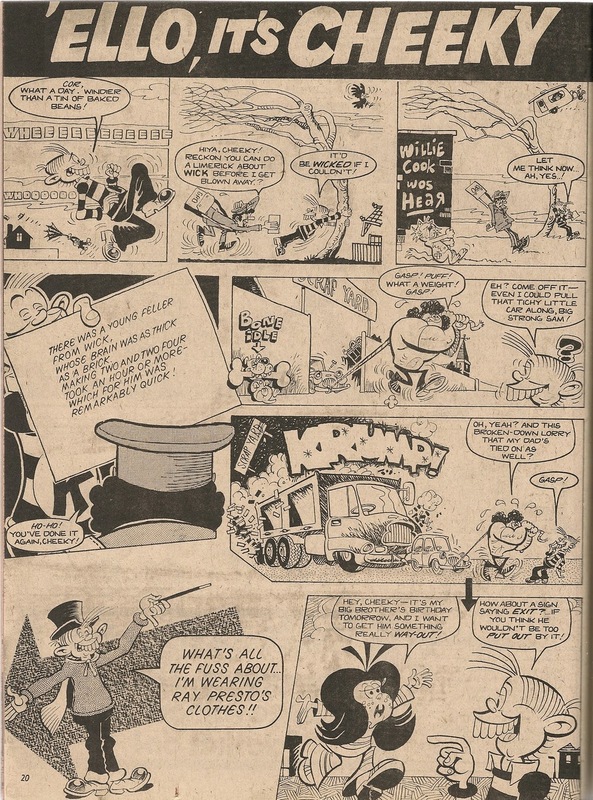 This time the majority of the art was originally seen in Cheeky Weekly dated 03 March 1979 (an issue in which the toothy funster sported a long scarf). 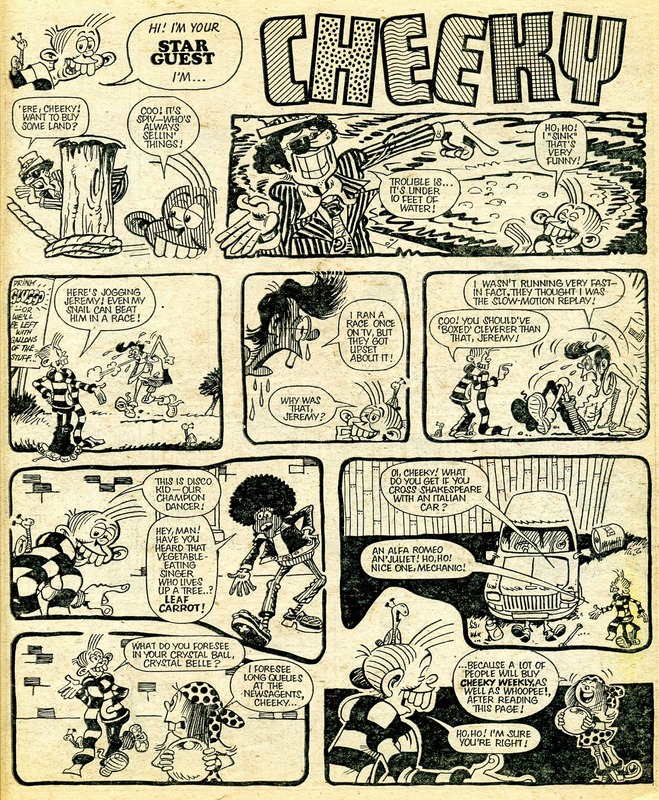 Cheeky Weekly 03 March 1979. Any Whoopee! readers who failed to be enticed by the toothy funster's visit would have enjoyed 29 further weeks untroubled by Cheeky's corny gags. No doubt those same Whoopee! 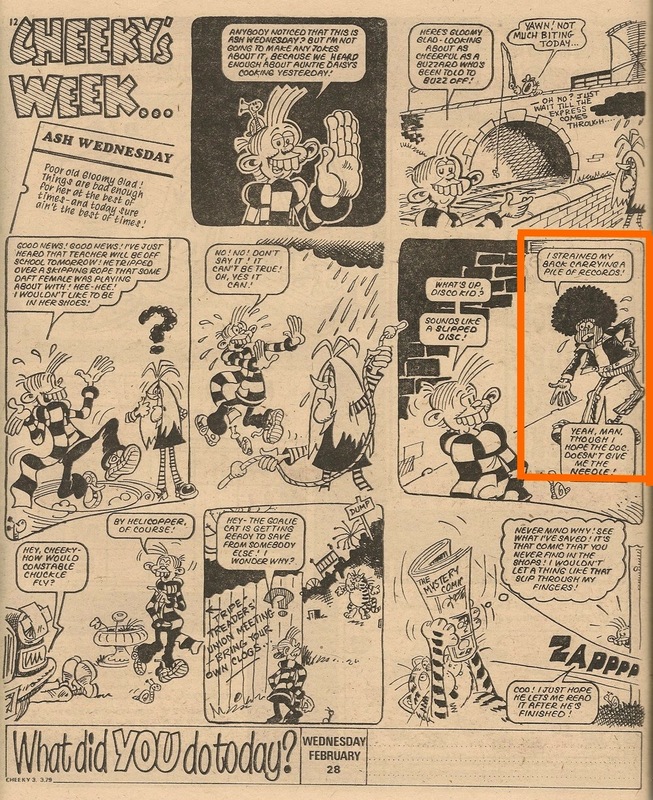 readers would have been dismayed to learn in their comic dated 02 February 1980 that our grinning pal, and a retinue of fellow Cheeky Weekly survivors, would be seeking refuge in the pages of their comic of choice as of the following week. I've been asked by performing arts company PanicLab to pass on some info regarding their upcoming show called R.I.O.T. which is about comic books. Here's a link for more info, and here's a review. All the best to PanicLab for the show.